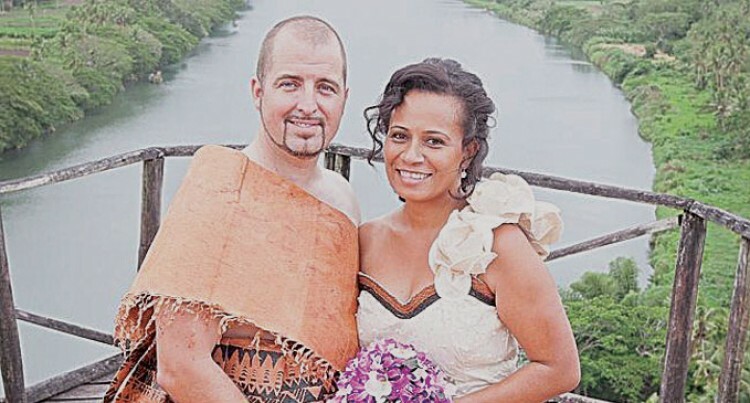 Jay and his wife Lolla who married in Fiji this year. Jay Whyte, 36, originally from Berowra Heights in Sydney packed up his life and moved to Fiji in 2005. Nine years later he is now the owner of a safari jet boat business living in Korotogo, Sigatoka, on Fiji’s Coral Coast. Jay’s Fijian fate was sealed on a family trip there in 1991. After befriending the hotel security guard Pita Matasau, who would later become his business partner, Jay was introduced to a side of Fiji he’d never seen, not its beaches but its lesser known interior. “My advice to anyone travelling to Fiji is take the time to explore the country and see the inner beauty of the islands,” he says. “Many people associate the white sandy beaches of the islands and snorkelling in the azure waters, but hidden in the interior of Viti Levu is the heart of soul of Fiji and here you will find amazing natural beauty of the land and the even greater beauty of the koi yata, kai colo or mountain people,” he says. It was this love of the mountains and an experience jet boat riding in New Zealand that led him to start up his business, Sigatoka River Safari, that takes tourists into authentic Fijian villages by jet boat — an epiphany he had in 2003 while stuck sitting in Sydney traffic. “I went to Hornsby Borders the next day, bought a book on how to write a business plan and got to work. Within thirty minutes the idea had evolved into transporting people into the Fijian interior to experience Fiji the way I did and allow them to discover what we call the heart and soul of Fiji”. However Jay says the Fijian culture is a mix of similarities with life in Australia. “There are a myriad of ways in which our cultures are different but in many ways there are shared similarities such as shoes off before entering a house and hats off in the villages and houses. “Fiji having a shared English history in that Fiji ceded herself in 1884 to the Queen of England, many of the systems we understand are built from the same pillars like schools, policing and government. Jay now has a love of lovo (food cooked in earth ovens) and the renowned kava, a traditional drink consumed at important ceremonies, meetings and other social settings. “The greatest aspect about life in Fiji is that they live each day for what it is and simply live in the moment,” he says. He is the Special Administrator for Sigatoka.